Santa Cruz Copper Repipe | Gladiator Repipe Inc. The Santa Cruz copper repipe plumbers from Gladiator Repipe are highly experienced and ready to help with any job that you have. Based out of San Jose, our company employs friendly technicians who can handle a wide variety of Santa Cruz repipe issues. We use premium products and materials, and each of our repipe specialists in Santa Cruz stays current with their lines of work. 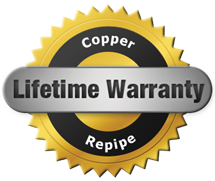 Our team of copper repipe specialists offer a 50-year manufacturer warranty, along with a lifetime workmanship warranty. Call us today at (408) 465-0025 to get your job done promptly. We make it easy to use our services and we always come recommended by past clients. Contact Gladiator Repipe when you are in need of a copper repipe in Santa Cruz, We want to be the team you turn to for all your copper repipe services. Our company maintains a reputation for performing high-quality work, and our goal is to take the stress out of the process. From arriving to appointments on time to cleaning up our work area, we’ll ensure that everything is done correctly. Our repipe specialists in Santa Cruz are committed to customer satisfaction. We believe that high-quality copper repipe services shouldn’t cost an arm and a leg. This is why we try keeping our rates as low as possible for everything we do. With our Santa Cruz copper repipe company on your side you will not have to worry about rust colored water, low water pressure, or leaks. Our Santa Cruz copper repipe services are a great value for the cost, and we can provide you with a price estimate before we get started. We’re honest and upfront with everything we do, and you can trust us to work with your best interests in mind. Close attention is paid to all of the details. Regardless of the size of your job, we’ll arrive with all of the tools needed to make it go smoothly. We’ll complete any copper pipe replacement in Santa Cruz in a timely and professional manner so that you can have a high level of peace of mind. We value our customers and want them to have a great experience when using our services. Questions are given our full attention and answered completely and honestly. You’ll be able to make any decisions with a high level of confidence. Dealing with a copper repipe in Santa Cruz doesn’t have to take a lot of time and effort. We’ll work efficiently and keep your property protected while we’re there. Our Santa Cruz copper repipe plumbers take pride in their work and won’t cut corners with anything they do. With our flexible appointment scheduling throughout the week, we can accommodate any of your needs and reduce the level of stress you feel about a job.